Welcome to Tablescape Thursday! Today’s tablescape is perfect for a casual breakfast, brunch, lunch, or dinner. This week I seem to be in a blue and white mood. Therefore, in keeping with that theme, I’ve decided to do a simple blue and white tablescape. For the centerpiece, I chose one of my favorite Fitz and Floyd Roosters in the Bristol pattern. I flanked the rooster with antique bottles filled with flowers from my garden. For the underpinning of my table, I chose a navy blue and white tablecloth from my collection of French Linens. For the place setting, I chose Mikasa English Countryside China, Reed and Barton Flatware, and simple clear glass goblets anchored by a French blue and white placemat. I added a red apple to each place setting to give the table a pop of color. I’m so happy that you stopped by for Tablescape Thursday. I hope that you have a blessed day and a wonderful weekend!!! A lovely tablescape. Love all of your touches. I especially think the apple at each place-setting sets the tablescape over the top. Thank you so much Valerie! I appreciate you stopping by and leaving such a sweet comment. I hope that you have a wonderful weekend!!! Hi Pam! Thank you so much for your sweet comments. I think that you and I like a lot of the same things when it comes to home decor. I love the French Country Vignette that you posted yesterday. It was beautiful! I hope that you have a wonderful weekend!!!. What a beautiful tablesetting. Just love the blue and white – so inviting! Thank you so much for your very sweet comments! 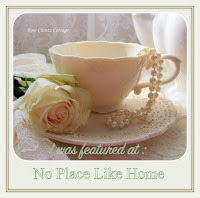 I just found your beautiful blog and love it! I’m so happy that you stopped by, and I hope that you have a wonderful and blessed weekend!!! Hi Carole! I’m so happy that you stopped by and thank you so much for the very sweet comments! I hope that you have a wonderful weekend!!! Fun table-scape full of some of my favorite things. I love blue and white and Fitz and Floyd “anything”! Happy Monday! Hi Snap! Thank you for your very sweet comments. I too love anything Fitz and Floyd. I especially love their roosters! I’m so happy that you stopped by, and I hope that you have a very Happy Monday!!! Shannon, your tablescape in blue and white is wonderful! Love the apples and your rooster! I haven’t taken my guy down from the top of my cabinets for a while. I must use him in a vignette one of these days. Thanks for sharing with us. Thank you so much Sandi! I so enjoy reading your blog. It must be wonderful living on Prince Edward Island. My daughter and I love Anne of Green Gables. I hope that you had a wonderful visit with all of your family. It looks like you all had a wonderful time! Thanks so much for allowing me to join your party! I hope that you have a blessed and wonderful day!!! Your blue and white table is beautiful. I especially love the rooster! Thank you so much Carol! I love roosters and have several displayed above my kitchen cabinets. I have such a weakness for them! Thanks again for stopping by!!! Such a classic color combo and beautifully designed. Thanks for joining us again at Celebrate Your Story. Hi Sandra! Thank you so much for your sweet comments, and thank you for allowing me to join the party! I hope that you have a wonderful evening!!! Oh I love this! It is the perfect transition into Fall with the apples! Thanks for sharing with Thursday Favorite Things! Hi Angelina! Thank you so much for hosting the party! I’m so happy that you stopped by to see my tablescape, and thank you for leaving such a sweet comment! I hope that you are having a wonderful weekend!!! Very nice and I love the pop of red with using apples. Love blue and white! The red apples are a nice touch. Reading several of your posts this morning to catch up. You do such a great job decorating, photographing, and writing. Mrs. Lane, I’m so flattered that you are reading my blog. Your comments are too kind! I hope that you are having a wonderful week!! !